while their ‘Purrducer’ Mike tries to keep them all very focused and well fed. fantasy & horror. Sometimes they conduct ‘intermews’ with special guests! with the “per”, “pir”, “por” or “pur” syllable are very deliberately misspelled. advanced hula & aerial dance at the Catgirl Island Purrforming Arts Center. purrim and purroper shrine maiden at times, but also the wild headbanger. and her favoritest desserts are the Nilla Cream Puddings, and the Purrfaits. even painting. Her worldy mewsical tastes include Celtic, Indian and J-pop. If Myayr’s reviews are longest, Vonny’s reviews are purrobably the shortest. sessions more as the fun social gatherings rather than anything too serious. are either the Peachy Ceamy Cobblers or the Fudgey Ice Cream Moondae. Vonny & Tara-chan have the 2 kitties Emmy (Emerald) & Zuli (Lapis Lazuli). boat S.S. TsuriNekoMimi is a 1985 Hatteras 60 Convertible motor yacht. been known to get excited by the mecha – related purrsuits. The club includes a special rapid response robot rescue & adoption team. & afternoons at the kyudo range, when her dance troupe is not purrforming. She is also an occasional swim wear and body paint model. fiction novels, comics, video games, movies, radio & TV shows. and her purrfurred swim wear are White bikinis with sheer purrled purreos. and her purrofession is the spa, which she co – owns with her wife Becca. bikinis and she is purrticularly fond of Cran – Apple Nummy Berry Cocktails. message, use the them as flashlights, or wear shoes that have flashy lights. hair which is often pulled in the ponytail out of the back of her Ranger cap. citizen with a home on the island, viewing Jeannie as a maternal figure. she became the co-purropurrietress of the spa and married Elizabeth. The spa is busy and purrofitable, and they have hired more employees. who are the children of The Kitt Inn’s mascots Sapphire and DosaNeko. to wear none at all, but she does often wear purretty bikinis & maillots. is mewsually Black, but it can change colors depending on her mood. She has several piercings such as the large stretchy holes in her ears. teaches art classes, and partners with Petra for beach volleyball matches. regarded as the league’s MVP. She and Petra are reigning champions. event staff, fans and the mewseum staff, exhibitors, volunteers & patrons. and tends a very healthy garden full of flowers, herbs, fruits & vegetables. appurred in “Nyanko and the Eye of the Idoi” and “Night of Dach Shadows”. of Catgirl Island in Fayume Park, not far from good neighbors Rica & Niko. fond of tiramisu, baklava and crepes slathered in strawberry & fudge sauce. resulted in a tempurrary mew purrsonality of a pirate and cat food smuggler. restaurant her real purrsonality returned & she returned to graduate school. and a Purrple bikini portrait of her- nyow as a doctor after getting her PHD! Kyra is actually short for Kyralyndalani but she tends to use the short name. purremiered in the Night of Dach Shadows http://catgirlisland.net/tales.html. and has the expurrtise for the decor, antiques, furniture and the horticulture. the colorful or sheer purrled purreos with the matching towels and flip flops. is her mood, from the color & brightness of her lovely bioluminescent wings. ghost stories, sings, dances, juggles foxfire, & purrforms other magick feats. Nami is actually short for Sha’Nami, but she purrfurs the shorter nick name. supurrvisor of the rotenburo (outdoor hot spurrings). Her best friend is Kyra. the cut-out and the purretzel type of maillots in many purretty floral purrints. 6 were adopted to the nearby good homes of the other Ladies of The Mew! She is of a lovely Eurasian ethnicity and usually is wearing a purretty saree. Tale of Catgirl Island which can be read at http://catgirlisland.net/tales.html! purrowess of Cat / Monkey style with a formidable finishing Kitty Pounce. wise teacher, friend & role model of the courageous spirit and bright soul. 6′ 2″ tall with the 3′ tail and weighs the firm 160 lbs, with the A+ blood type. action movies. Her favorite foods are roast beef, rice, seafoods & chocolate. twin sister Nyoka was more of the wanderer with interest in the mystic arts. expurrtise on magickal matters and well traveled worldly cultural purrsuits. two cats Tanzy (for Tanzanite) & Amy (for Amethyst) who enjoy the market. fun, with the special discounts, workshops, purresentations and treats. with the county’s many local artisans and the many out of town guest artists. ceramic, sculpture, textile, horticultural, architectural, landscape & body art. including the various purrivate galleries and the merfolks’ sister mewseum. beach volleyball camp, and she is extremely grateful for all the purrticipants. Petra has the slim physique with freckled fair skin, Red hair & Green eyes. Her purrfurred bikinis are of the flora and fauna colors, purrints & patterns. have also purrvided the good home for various adopted critters on the farm. they both inherited their mom’s distinctive neko ear pinna and the lovely tail. selling the local fresh purroduce http://catgirlisland.net/art/gallery2/225.html. with the “Nya”. She is kind, smart, agile and peppy, but does like the catnap. She also volunteers at the art mewseum, the food bank and various events. jujitsu, golf, soccer, cycling, paddle surfing and collecting My Little Pony stuff. Southeastern side of the island.Tara-chan’s pony is named Wildstar Blaze. Black hair, tail, hooves & the tips of her long, tapurred, supple equine ears. Strong, fast and athletic, Elaenor is in her mid 30’s, weighs the firm 850 lbs. manga. She purrfurs to be barehooved when she is not in firefighting gear. Here is a pic of Ellie by Mike. has the inny belly button and Ji Yun has the outy belly button. years but her true age & supurrnatural abilities have not been documented. and her various long & short boards are Yellow with the Black tiger stripes. She hopes to become a purrofessional SUP surfer and surf board-shapurr. Jeannie’s belly dance class assistant, her surfing mentor is Kara-Meow’l. Trini-chan volunteers at Catgirl island’s food bank and Mewseum of Art. She is a fan of My Little Pony, and her own Banker Pony’s name is Jimbo. has darker Brown hair & Hazel eyes, and both ladies wear the eye glasses. At work they they tend to wear the off – shoulder dresses or blouses & skirts. shorts, bikinis, yukatas & kimonos, depending on the occasions and activity. Kippurr snacks. Keiko’s favorite foods are Tuna and Purralines and Cream. Hanover County purrticipate in The Mew when it convenes closer to the water. but her main interests are aquatic ballet, modern, jazz and contact dancing. and a light Jade Green tail, with dorsal spines and a purretty translucent fin. volunteers at the Sea Dragons Sanctuary, and at the Halloween kelp maze. Purrple – Black hair, the Caramel Tan skin and the Lion Fishy mermaid tail. dark green hair of mid-tail length; the tail is medium Green with veil-like fin. launched her Mermaid Hot Air Balloon Tours which is a dream come true! past her hips to the Blue and Reddish colors of her Coral Beauty type of tail. style seahorse riding, and grooming the cute Leafy & Weedy Sea Dragons. She has light Blue eyes & long hair, & light Blue tail with spines & wispy fin. is also also a motivational leader & trainer of the Catgirl Island Surf Purrtrol. and he’s the web master for the North Carolina Web Comics Coffee Clatch. is Catgirl Island www.catgirlisland.net. Here’s Mike in his No Face costume. Aloha and thank y’all for visiting! I proofread this because I love the Mew and was very bored one day. There are a few punctuation things here and there but I expect they were left off to keep the formatting consistent. 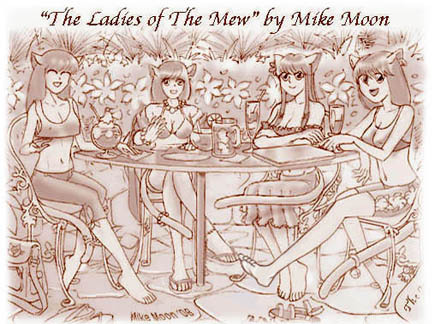 Header images on Catgirl Island in the About page (http://catgirlisland.net/about.html) and the Tales page (http://catgirlisland.net/tales.html) are missing. Vertical spacing before headers is inconsistent. They don’t all need to be the same but there should be at least one blank line for clarity. Thanks for noticing that. I’ve corrected most of it, though I will need to get back to Mike on the Mermaid sentence. Thanks. Aloha to Crystal Pluto from Mike! Thank you very much for your kind words and for pointing out those mistakes! We certainly appreciate your proofreading which helped to improve The Mew!